If you’re worrying about these five things when it comes to selling a restaurant, you’re not alone. Here’s how to understand the top risks associated with selling a restaurant so you can plan to overcome these risks with strategies that win. Selling a restaurant is never easy. For many operators, their business is part of the fabric of their life. It not only provides the means to financially secure their family, it’s also their connection to the community, a place of friendship and support, along with the place they are satisfied each day with the product of their work. There are risks, however, when selling a restaurant. We hope that by helping you be forewarned, you’ll be forearmed and ready to mitigate these risks. Risk #1 when Selling a Restaurant – Everyone will find out. Everyone will find out your business is for sale and employees will get scared and leave. This is a real risk when putting your business on the market. How does a strong restaurant broker keep this from occurring? First, with the signature of all buyers on a legal document called a confidentiality agreement. This is a contractual agreement not to disclose information that your business is for sale or risk legal action and some form of liquidated damages. Do confidentiality agreements work? In our experience, at We Sell Restaurants, these agreements do work to keep most people from sharing this information. We require both a confidentiality agreement and proof of funds to be submitted to us for any would-be buyer. That way, we reach a common agreement. The broker has highly confidential knowledge of the buyer’s financial picture and the buyer has highly confidential knowledge of the business listing. The risk to confidentiality usually occurs with inexperienced brokers who skip the qualification process and send out packages without both a confidentiality agreement and proof of funds in place. Risk #2 when Selling a Restaurant – My employees will leave. Many sellers are concerned that key employees may leave if they learn the business is for sale. In fact, many times that key employee is great target buyer for the business. He or she knows the ins and outs. They have experience that a lender holds in high regard when writing a loan for the business. They may have limited means to invest but in today’s lending market, they won’t need more than twenty percent down in most cases. In our experience, all employees, not just key employees, are less loyal to the actual seller (sorry to say), than they are to the location, the hours, the pay, the consistency and overall, the idea of the job they already have. Most employees resist change. Think about this from their perspective and it helps you overcome this risk in your mind. For employees, it is riskier for them to find a new role outside the business, than keep the one they have. Risk #3 when Selling a Restaurant – My Books Aren’t Good Enough for Lending. As restaurant brokers, we’ve seen it all when it comes to bookkeeping for the industry. In most cases, sellers are more concerned about getting through the lending process than the actual underwriting team. While small business owners aren’t always meticulous about record keeping; it is rare to see a business fail this lending test because the qualify is not enough. A standard chart of accounts for the restaurant business that properly reflects sales, cost of good sold, labor, occupancy and all other costs is difficult to even screw up in today’s world of POS systems capturing sales in real time and 80% of all transactions moving through your bank account from a credit card transaction. Don’t be so hard on yourself. In most cases, this risk can be overcome or at the worst, explained away to a good underwriting team. While few landlords outright deny a lease transfer, many will try and keep the seller on the lease as a guarantor, despite the quality of the new tenant. The way to mitigate this risk is to be sure that the restaurant broker qualifies the buyer in advance and carefully prepares a strong package of introduction to the landlord. Allowing the buyer to go in cold or set up his own meetings with the landlord is the greatest risk in this process. Most leases require that if a new buyer is qualified, the lease must be transferred. Getting out of the guaranty is a little trickier but can be done with the support and guidance of a qualified professional. Risk #5 when Selling a Restaurant – My business won’t Sell. On a scale of one to ten, this is the lowest risk to selling a restaurant depending on the advice you get and the broker you use. At We Sell Restaurants, we see 90% of our inventory sell and a very active and willing database of buyers. On the other hand, there are major brokerage firms that report as little as 10 – 15 percent of their listings that make it to the closing table. If you are selling a restaurant, ask everyone you interview how many restaurants they have sold, not listed, but sold in the last year. This is one of your greatest assets. You should put anyone that wants the job of handling this transaction through a thorough vetting. These five risks are real, not imagined. They are manageable, however, if you study this article and plan ahead to mitigate these issues and others that can arise in selling a restaurant. 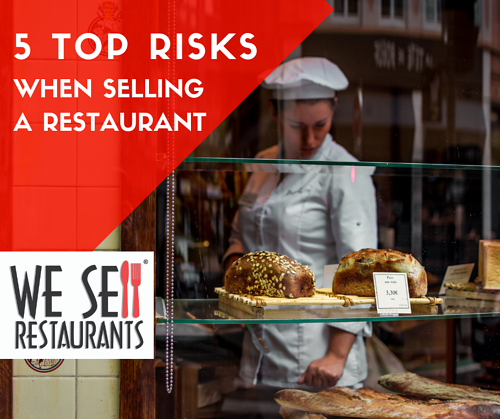 Above all, choose a professional with knowledge of these risks and others before listing your restaurant for sale. Interested in seeing our restaurants for sale? 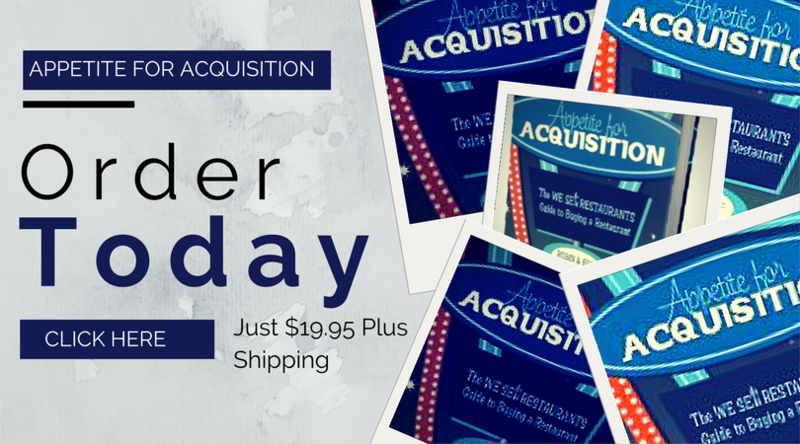 Click this link for instant access to hundreds of new listings.